Setup an "X" Shape grid. You can make it very small so play is fast and touches are quick -OR- make the grid larger for longer passes. 4-6 player on each opposite corner with 2-3 balls on each start line. Two players, one from each corner, dribble at same time at center cone (flat marker or Mannequin), perform a 1v1 move and continue to open corner cone. 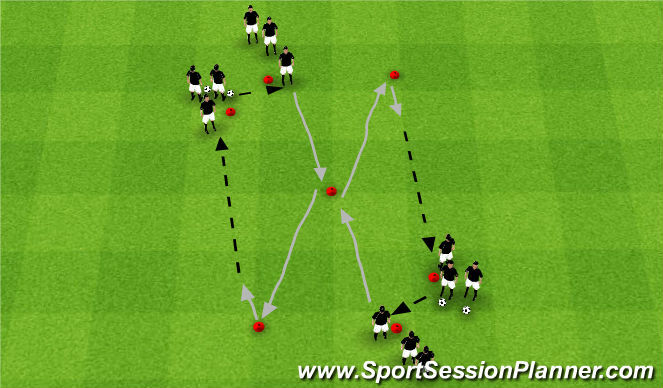 *Can also have players perform a cut back turn/move on end cone before passes back to start player. *Can have players start with a pass & first touch (as shown) or have players start with a dribble and have a ball each at start. VARIATION #1 - After 1v1 move in middle, Players Accelerate with ball to end cone and then turn & pass to next player in opposite start line. VARAITION #2 - After 1v1 move in middle, players pass to a player on end cone who receives with firs touch around cone and then passes to next start player. VARIATION #3 - After 1v1 move in middle, players pass to player on end cone and who combines back with central player to setup give & go pass around corner cone. 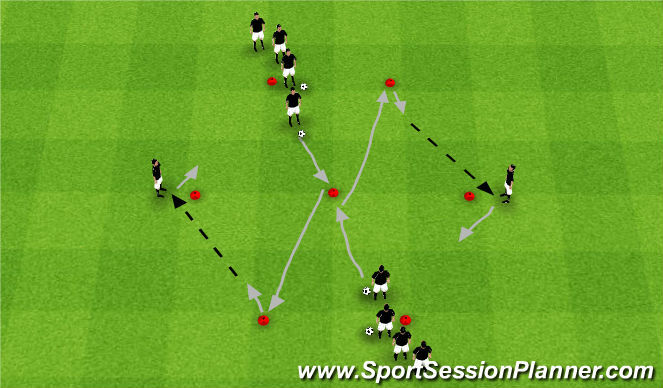 VARIATION #4 - Have players perform a cut back turn/move on end cone before passing to start player.